We’ve been making up big batches of Muesli in the Intelligent Gourmet kitchen this week because it’s so darn healthy! High in fiber, protein and whole grains, it’s a high-octane start to your day. Let’s take a closer look at some of our “Super” ingredients. Coconut & Coconut oil: Promotes weight loss, supports cognitive function, promotes heart health and thyroid function, and strengthens the immune system. Raw Cacao: High in anti-oxidants which help your body break down environmental toxins, and contains flavonoids which aid cardiovascular health and help prevent cancer. Millet & Rolled Oats: Both have heart-protective properties, but millet in particular is high in magnesium which lowers high blood pressure. They’re also high in fiber; and fiber from whole grains helps prevent gallstones and possibly breast cancer. What’s your favorite way to enjoy Muesli? On yogurt? Swimming in almond milk? Or maybe on top of fresh summer peaches. At Intelligent Gourmet, we love summer because that is when our favorite produce is in season! Right now, there are a few superfoods in the farmers markets that I think you’ll all want to know about because, in addition to being incredibly good for you, they can also help whittle down your waistline. Who doesn’t want help with that during bikini season? When you eat fruits and vegetables in their season, not only will they taste more flavorful, but their health benefits will be amplified by their freshness. So go out to your local market this weekend and indulge in food that tastes great and will help you look great too! Raspberries – Low in calories and high in fiber, raspberries are an excellent source of vitamin C, manganese, iron, and cancer-fighting antioxidants and phytochemicals. Lychees – A 2009 study in Japan found that lychee extract, oligonol, may reduce tummy fat in people with metabolic syndrome and improve overall health. They also contain high levels of polyphenols, promoting heart health. Kale – Another low calorie, high fiber plant, Kale is the king of leafy-green vegetables, crammed with iron and calcium. Blueberries – These berries contain the most antioxidants of anything you’ll find in the grocery store, and are high in fiber. But their main claim to fame is their anti-aging effects. Watermelon – Of course, watermelon is one of the best superfoods for weight loss; it’s all water! Well, water, delicious sweet flavor, and tons of lycopene (which prevents hypertension). It’s also great for helping with circulation (if you know what I mean). My best tip for using these to promote weight loss in summer is to keep a bowl of berries on your kitchen counter. Then, when you’re feeling snacky, just grab a handful as you pass by. Instead of feeling guilty for snacking, you’ll feel great that you’re doing something good for your body. The health benefits of pistachios are remarkable, possibly outdistancing even the wonderful walnut and amazing almond. Here’s why we love’m! Pistachios are one of the lowest-calorie nuts – and even though nuts are generally considered “high fat,” the fat they have doesn’t all convert to fat in our bodies. The fibrous cell walls of nuts actually make the fat in them difficult for our bodies to absorb, so we only take on a portion of what shows up on the nutrition label. But when you break down that cell wall, like with peanut butter, the fat becomes more available for absorption. Thirty pistachios are about 100 calories, perfect for snacking. High in Vitamin E, pistachios help your skin regenerate and heal, giving you a fresh-faced, healthy glow! Vitamin E also protects against UV rays and premature aging, as well as skin cancer. Pistachios contain two carotenoids rarely found in nuts, zeaxanthin and lutein, which are powerful antioxidants for fighting free-radical damage. Lutein is normally found in dark leafy green vegetables, and protects the eyes from sun damage and oxidative stress, helpint to prevent cataracts, retinitis, pigmentosa and macular degeneration. Lutein is best absorbed when eaten with fat, so while you might have to add avocado to reap the full benefits of a salad, the pistachio has it all – in a nutshell. Increasing good cholesterol and lowering bad cholesterol means that pistachios reduce the risk for cardiovascular disease. 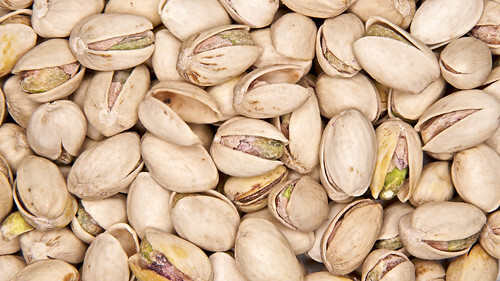 Another heart-healthy fact is that just 1 oz of pistachios carries as much potassium as your average banana (potassium is good for preventing heart disease and high blood pressure, as well as reducing anxiety and stress). With all the health benefits of pistachios, it’s amazing that we don’t use them in more ways than eating straight out of the shell (it’s the best way, but still!). If you’re looking for more ways to use pistachios, check out this recipe for a pistachio-based dessert (that isn’t ice cream! ).